In a perfect world, fiberglass skylights are a fine option for metal roofing systems. But the world’s not perfect, is it? Sometimes it rains … and fiberglass skylights are prone to leaking over time. Sometimes it hails … and fiberglass is susceptible to cracks, which can cause further rain damage inside your facility and lead to costly repairs or replacement. And, frankly, fiberglass wears out before most roofs do … and its yellow, brown discoloration can reduce the amount of transmittable light. All of that can put a crimp in your plans for daylight harvesting, which – when effective -- can greatly reduce energy costs while boosting productivity. Don’t fret, facilities managers. 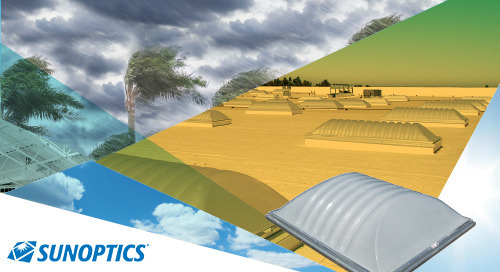 We have a solution … and it’s our EZY Curb™ Daylighting System from our Sunoptics® brand, which for years has offered high-performance prismatic daylighting for warehouse and manufacturing environments. Easy to replace. Our three-step installation takes a fraction of the time and cost of curb-based systems, and its modular design is ideal for roofers instead of specialized metal mechanics. Virtually leak-proof – and thus maintenance free. Compare our five and 10-year limited leak-free warranties with fiberglass solutions, which offer limited or no warranty. Provides more insulation qualities to limit losses from heat transmission and HVAC. Plus, our Signature™ Series skylight, with Sunoptics® prismatic optics and dome design, captures more light throughout the day than any other passive skylight on the market. Long-lasting, with minimal yellowing over time. Our use of high-quality steel components, polycarbonate and impact-modified acrylic provides longer-life and lower maintenance costs. Safer, as the high-profile design significantly reduces the risk of fall-throughs. Hail resistant (in certain configuration options) for up to Class 4, or 2-inch, hail. Economical, thanks to lower cost of ownership, reduced energy costs and a payback period of as little as two years. And when paired with LED luminaires and on-board lighting controls, the savings can be even more significant. With EZY Curb available, there’s no longer any excuse for metal-roof buildings to maintain inefficient, poor-performing fiberglass panels. Not when (near) perfection is an option. Learn more about this and other daylighting solutions by visiting our Sunoptics website.